Day 2 is all about writing your Christmas cards. I don’t know what that means to you, but in CrumpetLand it requires lots of alcohol, Phil Spector’s Christmas CD and lots of glitter! When I thought of this challenge, I thought this one would be quite easy, but in typical Crumpet style, I underestimated lol. So here we have 5 nails, 1 I’m super happy with, 2ish that are ok, 1 dupe and 1 total disaster lol (well it wouldn’t be true Crumpet nail art without some disastering J). 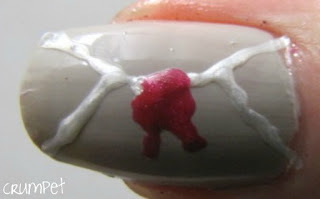 All the nails have 2 bases of OPI Skull & Glossbones, because initially I was going to do them all as either the envelope or the inside of the card, but after I’d done 2 nails I thought that would be really samey, so I switched tack, and could have done with a different base, but never mind! 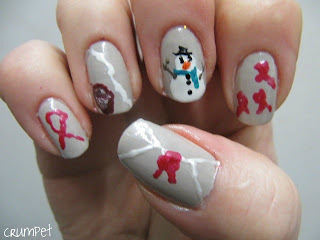 The thumb is supposed to be the back of an envelope, sent to a loved one, and especially sealed with love. The index finger …. Hhmmm. It’s actually NOT the Breast Cancer Awareness ribbon, although it looks *exactly* like it lol. It’s supposed to be the way I sign kisses after my name. I do one loop, from NW to SE, up to NE and then down to SW. Doesn’t quite work with a nail pen, which is why I then tried to do a bigger one on my pinkie, which looks closer to the real thing. 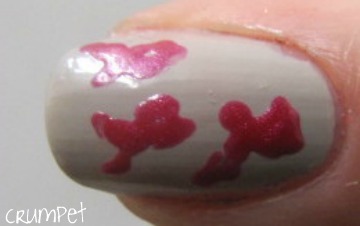 Middle nail – ah, I love, and this could be the first successful Crumpet art ever! This may be the first time you can tell what it is without me telling you lol. 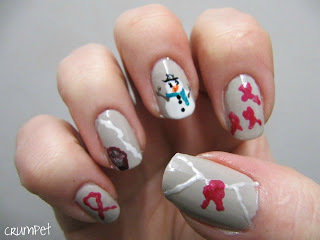 So after I gave up on doing a nail with handwriting on it, I thought I’d do one with a typical Christmas card design, and opted for a snowman. When I choose my Christmas cards, all I demand is that whatever is on them is fat – fat snowman, fat Santa, chunky kittens …. Lol. So there’s my snowman, AND he has arms and a carrot and a scarf! 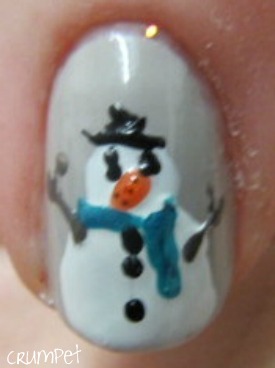 Wow, look at all the detail you can do with a nail pen! And then we have the ring finger fail lol. I just couldn’t work out how to render what I had in mind. When I think of Christmas cards, I also always think of how they fall down. You hang them on a wall, and in the middle of the night you hear a great big whooooooosh, as they drop on the floor. So the strange wiggly piece of white is supposed to be dangling string, and the blob is supposed to be a blurry in-motion Christmas card as it drops to the floor. Course it is, Crumpet! Ah, I am quite embarrassed by my nail “art” sometimes, although in my defence I feel I should point out I had to do it all with my wrong hand because of the silk wrap on my other hand :p My nail art always reminds me of something a critic once wrote about John Grisham – “his imagination keeps writing cheques his talent can’t cash”.